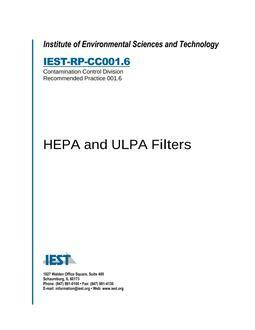 This Recommended Practice (RP) covers definitions, equipment, and procedures for leak-testing HEPA and ULPA filters in the factory as they are produced, at the job site before they are installed, and after they are installed in cleanrooms and in unidirectional-flow, clean-air devices. 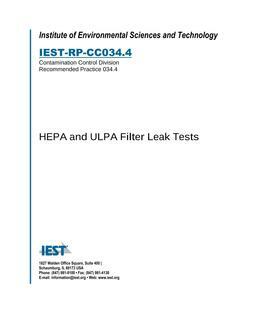 In this edition, procedures for factory and in-situ testing are separated for ease of use. When used with other RPs, including IEST-RP-CC001, IEST-RP-CC002, IEST-RP-CC006, IEST-RP-CC007, IEST-RP-CC021, IEST-RP-CC028, and IEST-RP-CC036, this RP may be used to define the basis of an agreement between customer and supplier in the specification and procurement of HEPA and ULPA filters, and in the testing of unidirectional-flow, clean-air devices and cleanrooms. Supersedes previous editions of IEST-RP-CC034.